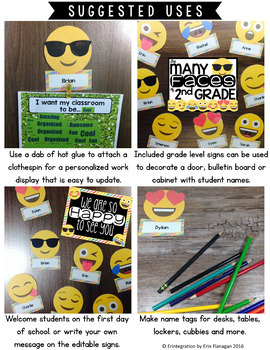 Emoji classroom decor editable bulletin board accent pieces. 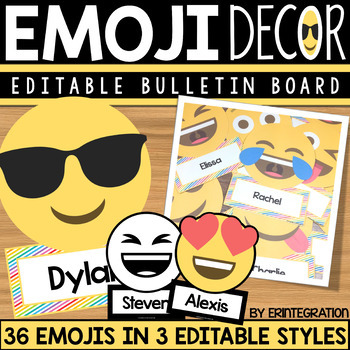 These 36 editable Emoji decor pieces for bulletin boards make a great door, welcome bulletin, name tags, labels, and more! Choose from 3 styles of Emoji accents: rainbow border, black border, or use the blackline set and have students color their own! Also includes ready-made signs for PreK-6th grade, 3 welcome signs and editable signs to personalize. 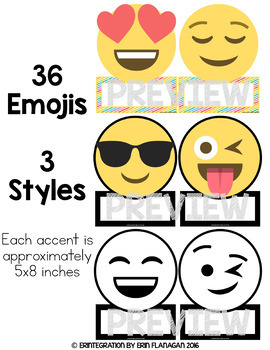 ★ 3 Sets of 36 Emoji Decor Accents - editable in both the included editable .pdf and a 57 slide PowerPoint file. Each editable accent is available with a rainbow border, a black border and in black & white. ★ 3 Welcome signs that say "We are so happy to see you"
★ 8 "The Many Faces of...." sign - ready made for PreK-6th grade in 2 styles. 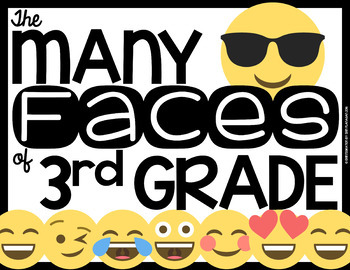 ★ 3 styles of editable "The Many Faces of..." signs to personalize (editable .pdf and PowerPoint). Emoji decor accents measure approximately 5x8 inches and signs measure approximately 8x10 inches when printed as is. This can easily be adjusted smaller when printing.